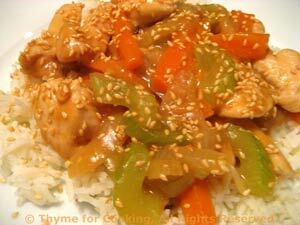 Thyme for Cooking Dinner tonight: Stir-Fried Sesame Chicken. A quick stir-fry during the start of a busy season. If you have any mushrooms left, add those as well. Even if you don't regularly eat peanut butter, it's a good pantry staple, as we use it through-out the year.